Can We Trust the Sustainable Meat We Order Online? Direct online sales of grass-fed and organic meat directly have been growing, but so are questions about its origins. The best way to know where your beef comes from is to order directly from a farmer. But not everyone can afford to pay farmers’ market prices or to front hundreds of dollars for a cow share and then try to fit all the vacuum-sealed meat into their freezer. For this reason, a host of online resources are now available to ship the most sustainable meats directly from family farms to consumers’ doors. All in manageable quantities at a reasonable price. Take Seattle-based Crowd Cow. The start-up stole the scene in 2015 with $2 million in venture capital investments and a first-of-its-kind model for selling meat online. In effect, Crowd Cow founders Ethan Lowry and Joe Heitzeberg used their tech backgrounds to bring the ranch to the internet. 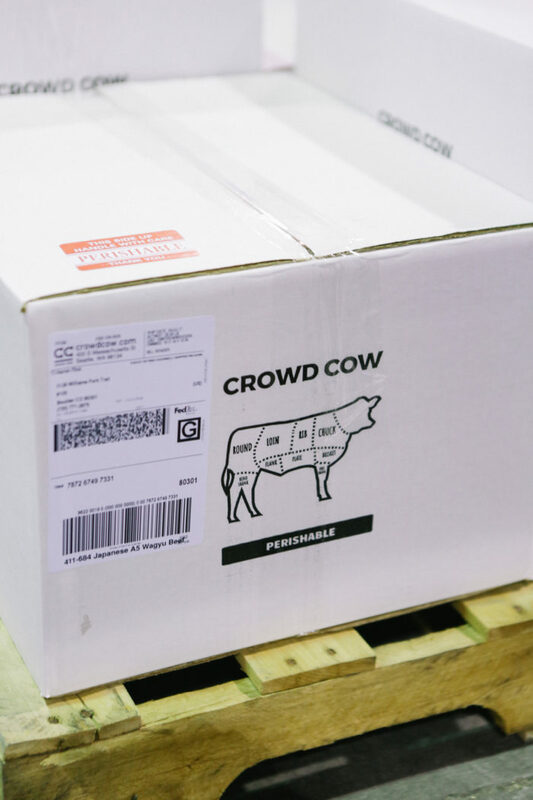 Crowd Cow offers whole animals for sale in online “events,” one cow at a time—in retail-cut packages—until they’re sold. They also provide customers with the full story of the ranch and the animals. “We practically give you the address,” said Lowry. While the technology and finance worlds swoon over these entrepreneurs, they also set up an extra layer of mediation between the producer and buyer. And, given the ongoing potential for greenwashing in the food sector and the questions surrounding animal welfare in the USDA Organic certification, it’s worth asking: Can we trust the meat we buy online? 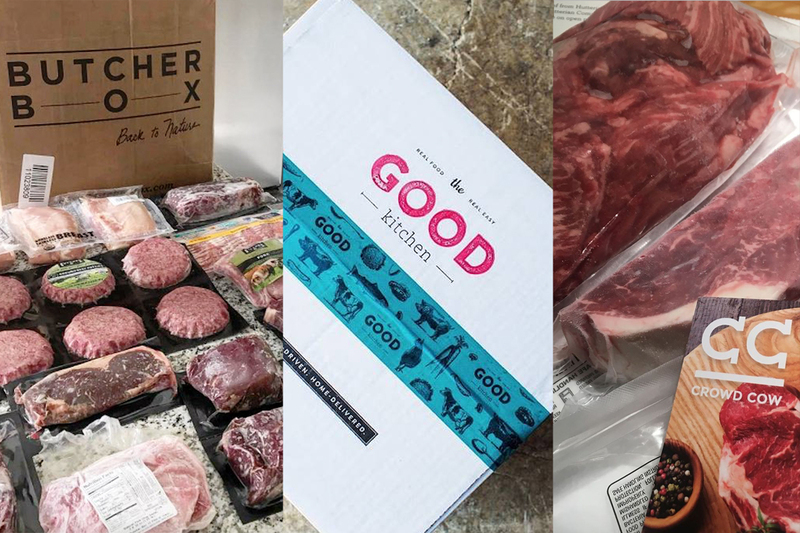 Both Crowd Cow and another startup, Butcher Box, have been called out on social media recently for failing to live up to their mission statements, raising questions about transparency in the new digital food economy. Civil Eats followed up with the companies and sustainable meat advocates to learn more about some of the challenges and contradictions involved in trying to source sustainable meat for a profit in today’s economy. Concerns about the overall lack of transparency among well-funded startups led Rebecca Thistlethwaite, farmers program manager for the Niche Meat Processor Assistance Network at Oregon State University and author of The New Livestock Farmer, to strike up a conversation with the customer service department at Butcher Box in June. In a conversation with Civil Eats, Salguero explained that Thistlethwaite’s negative customer service interaction was the result of the company growing big really fast. “At that point, we were shipping 40,000 to 50,000 pounds of grass-fed beef a month,” he said. And he described a larger issue facing every e-food company promising sustainably raised meats, especially grass-fed beef: sourcing a reliable supply. While beef consumption has declined in the U.S., the grass-fed beef market is growing dramatically. According to a recent study by the Stone Barns Center for Food and Agriculture (based on Nielsen data), retail sales of grass-fed beef has grown by 100 percent every year for the past four years. Marilyn Noble, communications director for the American Grass-fed Association (AGA), says that the market’s momentum is undeniable. And with that opportunity comes the potential for deceptive practices. Several sources we spoke to mentioned the practice of feeding cattle manufactured grass pellets rather than keeping them on actual pasture, for example. “There really isn’t anything out there that guarantees that consumers are getting what they think they’re getting,” said Noble. In this muddled market, newcomers like Salguero have taken sourcing grass-fed beef into their own hands, which is how he ended up in Australia. “Beef from Australia is considered to be higher quality and better for you than the majority of meat from America,” he wrote in a blog post on the company website shortly after Thistlethwait’s critique, citing the country’s grading system and animal welfare standards. The trouble is, since Congress repealed the country of origin labeling law (COOL) at the end of 2015, there’s no way of know whether the beef, pork, and turkey is imported unless the company chooses to come clean on its website. Grass-fed beef advocates take issue with imported beef, citing the carbon footprint and displacement for American farms. “There’s so much grass-fed in this country that’s so good and would probably fill the niche,” said Noble. However, the cost of production for domestic grass-fed beef is higher because of the vast consolidation in the meat industry has caused a “distribution bottleneck” for small-scale producers. 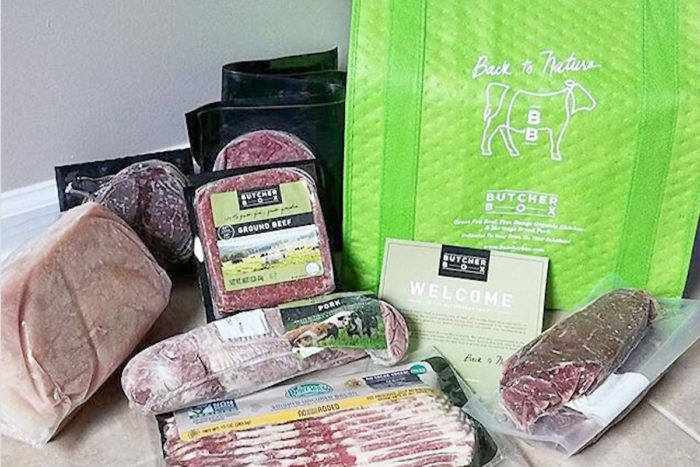 Noble believes that companies like Butcher Box could help re-establish new distribution networks and provide the reliable supply that these companies demand—but to do that, they would probably have to pass some of the increased price on to consumers. Salguero believes that the scuttlebutt over imported beef is misplaced. Regardless of the source, he says all grass-fed is better than the factory-farmed alternative. “Here’s the problem: 98 percent of the beef sold in the United States is corn-fed from a feedlot,” Salguero said. Crowd Cow has faced similar challenges. Sustainable meat advocates, like butcher and author of a James Beard Award-winning series of butchery books Adam Danforth, followed the company’s ascent beginning when it launched in 2015. He was intrigued by the company’s mission and crowdfunding model to create “something outside the [dominant] paradigm.” Yet he was skeptical about a venture capitalist-funded business upselling and “fetishizing” meats that were disconnected from their local food systems. “I didn’t feel like it ever was a proposed system that would have a net benefit for those who are trying to improve meat accessibility,” Danforth told Civil Eats. Last spring, he noticed a major shift when a Crowd Cow email announced a sale for grain-finished beef from a Washington farm. This is not the same as beef from a feedlot, but some purists decry finishing a ruminant animal on grain, period. Although Danforth is not in that camp, he said, “It wasn’t in the original model or the mission of the company.” But the major blow came when Crowd Cow sold Kobe beef direct from a farm in Japan this last June. For their part, the Crowd Cow founders pled inexperience and were shocked by the social media blowback. “We started it as a local little company,” said Heitzeberg. “We came at this as software people,” added Lowry. But the pair also asserted that nearly all of their sales have involved U.S. beef from small-scale farms, and they state that the response from their customers and producers has been nothing but positive. “We see ourselves showing people that beef is not a commodity, and that is going to fuel the success of the smaller farms that have been lost in the traditional production system,” said Lowry. While Crowd Cow would not share specifics on company growth, they reported that at the end of 2016, 65 percent of their sales were within 10 miles of Seattle. Nine months later, they were shipping to all 48 states. On the supply side, independent ranchers are also seeking out Crowd Cow. “We’re giving the producer a viable business model,” Lowry said. And the relationships may translate into the incremental change that advocates like Danforth are seeking. For mission-driven entrepreneurs, one of the hardest lessons is that delivering local food on a massive scale is harder than it looks. 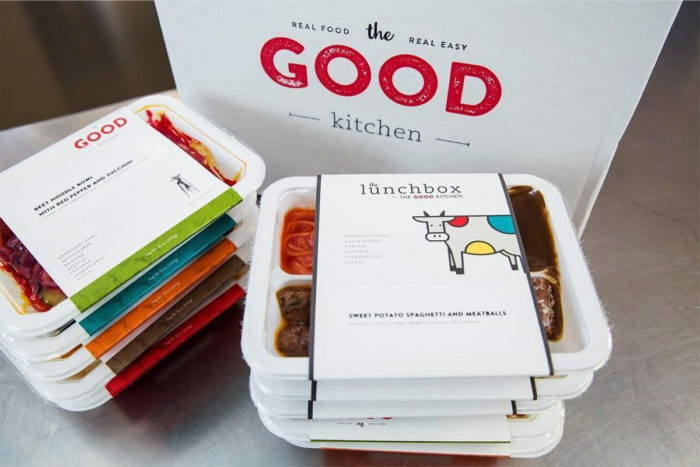 Like several other similar startups, Amber Lewis’s Charlotte, North Carolina-based prepared meals company, grew out of her own personal Paleo diet in 2011. Initially, Lewis scrambled to find enough locally sourced meats in her area. “Our protein source has run the gamut of every scenario you can imagine to get sustainable meat in our door,” she said. Either way, Lewis from the Good Kitchen says she sees consumers are getting smarter. “They’re reading labels, they’re doing research and they’re mission-driven with their money,” she says. Indeed, that fact what will likely ensure that the market for alternative meat continues to expand. The question is how domestic producers will flourish along with it. Photos courtesy of Crowd Cow, Butcher Box, and The Good Kitchen. The Australian dollar is about 25% lower than the US dollar. That explains quite a bit of why Aussie beef is cheaper. There is zero that US producers can do about that. There's so much greenwash in the beef sector, but little in the way of comprehensive certifications that address the full array of beef supply chain hot spots. As far as I can tell, the only comprehensive certifications available (i.e., akin to FSC certifications for beef) are (a) GrasslandsAlliance.org, (b) Food Alliance's beef cattle and bison standard, and (c) The Sustainable Agriculture Network (SAN) standard used by Rainforest Alliance's certifications. All of the others play important roles, but only address a small segment of supply chain hot spots, and whether cows really ate grass. Getting a good comprehensive program in place will help drive more business to/better incentivize the growing ranks of regenerative ranchers who ARE making an important difference via the fascinating things they are doing via their innovative management approaches. I have just read your article," Can We Trust the Sustainable Meat We Order Online. " You have addressed a subject that we as a family farm and producer of very high quality grass-fed beef fight with daily, which is tech and marketing people trying to step into the farm to fork market in the name of sustainability and environment only to make money. Mind you I have nothing against someone making money on a project as we all need to. I have personally spoken to several of these entrepreneurs and when I came away from the conversation the one thing they had in common was that their main long term goal was to build a company that shows growth in sales and market potential and sell it for millions! Which is what the people in the tech and marketing industries are programed to do, I understand that. This is not what long term sustainability and clean food is based on, they actually become just another big business chasing profit at any cost. When the consumer wants to find food that is straight from the farm it is easy, all they need to do is look past all the paid ads and fancy marketing that these organizations bombard them with and look for a farmer's website to buy direct from the farmer. There are plenty of good family farms that have websites and sell over the web, they may not be in your back yard, but in todays world I think it has actually come to the point that produced in the United States needs to be considered LOCAL. Mind you not all grass-fed beef is created equal and not all farms produce the same quality products, the consumer may need to do a little research or ask for references. I applaud you for addressing this issue, organizations like yourself need to help the consumer get past all the fancy marketing and labeling and guide them in the direction of finding their own farmer or farmers to buy direct from. It has never been easier than it is today to buy direct from a farm family that is producing a high quality, clean, sustainable product and have it delivered straight to your door.